Since its inception, Punjab Higher Education Commission (PHEC) has been working extensively on implementing various faculty development programs to improve the quality of teaching & research in the Higher Education Institutes (HEIs) of Punjab including allocation of funds for the award of foreign PhD Scholarships, foreign Post-Doctoral Fellowships, International Travel Grants (ITGs) etc. 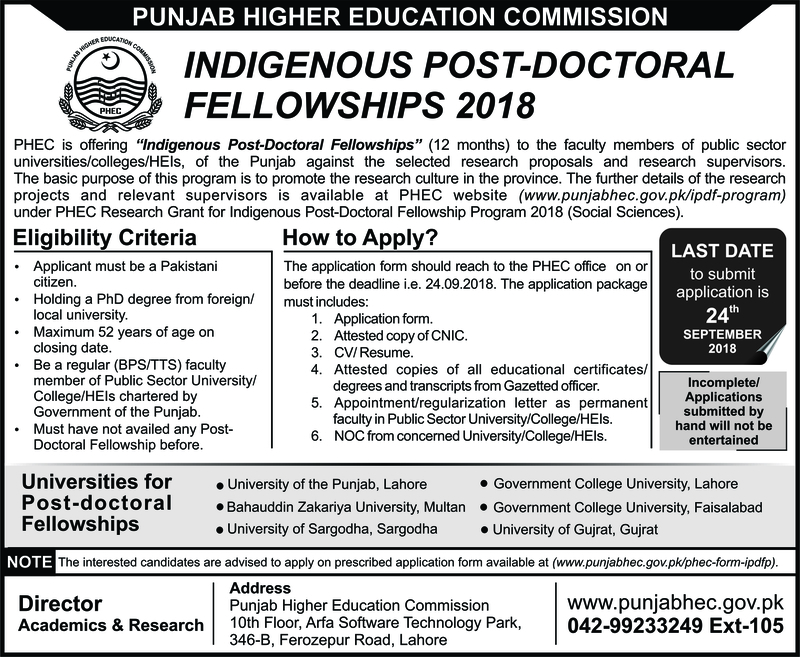 Now, PHEC has taken another step to further this goal by announcing “Indigenous Post-Doc Fellowships” to faculty members of public sector universities/colleges/HEIs of Punjab. After the selection of research supervisor from the public sector universities/colleges/HEIs, PHEC offering the Indigenous Post-Doctoral Fellowships. All post-doctoral research applications will be processed/ reviewed by Research Supervisor and shortlisted applicants will be interviewed by committee headed by Research Supervisor, Subject Expert (nominated by research supervisor) and nominee of the PHEC. The final award letter will be issued to successful candidates on the recommendation of above mentioned committee/ research supervisor. Fellowships will be provided to the successful candidates for the period of twelve (12) months. The funds will be transferred to the concerned university which will administer and ensure the timely completion of the project. Applicant must be Pakistani citizen. Holding a PhD degree from foreign/ local university. Maximum 52 years of age on closing date. Be a regular (BPS/TTS) faculty of Public Sector University/College/HEIs chartered by Government of the Punjab. Must have not availed Post-Doctoral Fellowship before. Maximum funding for each project under PHEC Research Grant for Indigenous Post-Doc Fellowship program is up to Rs 1.50 million including stipend of Rs 50,000/- per month for fellows/researchers residing outside the city and Rs 1.20 million including stipend of Rs 25,000/- for fellows/researchers residing in the same city subject to study leave. If study leave is not provided, the stipend to post-doc fellow/researcher will be Rs 25,000/- per month residing outside city and Rs.12,500/- for residing in the same city. The amount will be released as per below allocated budget heads. No additional cost/ funds will be provided to the Research Supervisor or Post-doctoral fellow/ researcher. 9 Purchase/subscription of Databases/information/ literature etc. Budget mentioned by Research Supervisor can be readjusted on the advice of the PHEC Research Grant Selection Committee. Purchase will be subject to recommendation of supervisor (Note: Bill vouchers are mandatory). No funding will be provided directly to Research supervisor and fellow/researcher. All funding will be made through the host university in joint account. Equipment: Laptop, printer, scanner, furniture or any other equipment purchased will be used by Fellow/Researcher, after completion, equipment’s will be retained with the department of Host University. The Post-doctoral research grant account will be operated jointly by Supervisor and Treasurer of host University. The duration of post-doc must not exceed than twelve (12) months. If the employment city and host university of the Post-Doctoral Fellow/ Researcher is in same city the stipend will be rupees twenty five thousand (25,000/-) per month subject to study leave. If not, than rupees fifty thousand (50,000/-) per month. The post-doctoral awardee will execute the project and prepare the research report under the supervision of Research Supervisor. The post-doc fellow/ researcher must have at least one publication in an HEC recognized local journal (not less than Y category) or international journals (JCR and Scopus indexed Journals). The publication with status “Accepted” OR “In Press” could also be considered conditioned to have been approved for publication within six (06) months after the date of acceptance. A post-doc fellow/ researcher shall sign an agreement with the PHEC/ University on non-judicial paper (stamp paper) to the effect that in case the post-doc fellow/ researcher fails to complete his/her study, s/he will refund PHEC the total amount released on his/her studies by the PHEC. In addition, a personal guarantee of a person of means on non-judicial (stamp) paper to the effect of ensuring the recovery in case of default would need to be furnished. PHEC would monitor the research progress/ performance of the Post-doc fellow/ researcher and the financial utilization report on three (03) month basis. Thus, postdoc fellow/ researcher must submit the reports through his/her supervisor. How to apply for Post-Doctoral Fellowship? Attested copies of all educational certificates/ degrees and transcripts from Gazetted officer. Appointment/regularization letter as regular permanent faculty in Public Sector College/University/HEI. All the above mentioned documents should reach to office within deadline. Incomplete application and application with missing documents will be rejected. Incomplete and application By hand will not be entertained. All post-doctoral research grant applications will be processed/ reviewed by Research Supervisor and shortlisted applicants will be interviewed by committee headed by Research Supervisor, Subject Expert (nominated by research supervisor) and nominee of the PHEC. The final award letters will be issued to successful candidates on the recommendation of above mentioned committee/ research supervisor. Queries can also be sent at the following email address: muhammad.adeel@punjabhec.gov.pk.